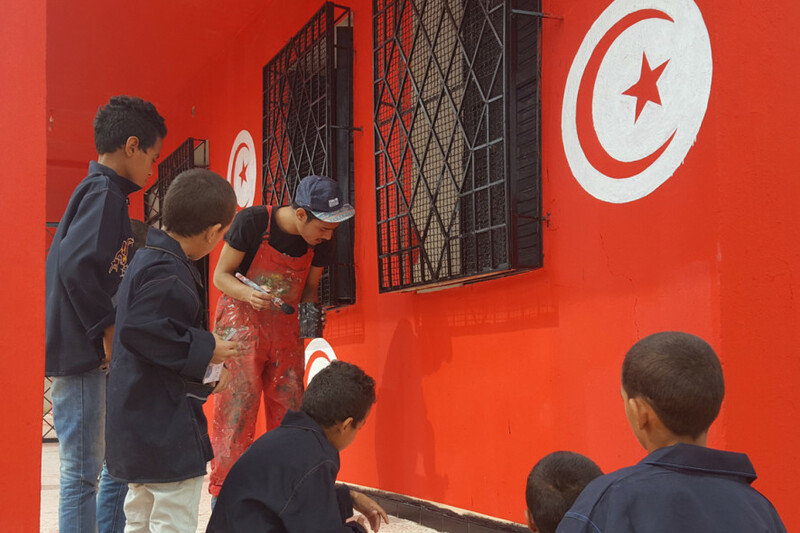 We Are Here has implemented alternative creative cells for the profit of vulnerable and discriminated young people and local population, with special attention to women in both Tunisia and Palestine using Mural and Street arts. Cultural spaces were established in both Tunisia and Palestine: in Tunisia through reconstructing 10 cultural polyvalent spaces in schools and educative institutions located in the poor and marginalized interior regions, and in Palestine through establishing artistic, cultural and mural activities on the walls and in public spaces of the Old city of Ramallah, where Tunisian artists, local Palestinian artists and local community created an open-air exhibition and interactive workshops. The main objective of the project was to consolidate Street Arts as a means of work in framing public awareness and advocacy strategies to promote respect for marginalized groups and their active participation in society. Fanni Raghman Anni Association (FRA) is a youth-driven cultural nongovernmental organisation registered in Tunis in 2013. Fanni Raghman Anni’s vision is an equal society without discrimination. FRA promotes innovative youth activism with the arts, specifically in poverty-stricken areas and marginalized neighbourhoods. The organisation is committed to raising social awareness and consciousness on human rights issues through creative and artistic expressions. The partners in this project are the Municipality of Ramallah in Palestine, and Youth Forum for the culture of citizenship an association in Tunis, working on human rights, citizenship and promotion of culture in the interior regions. 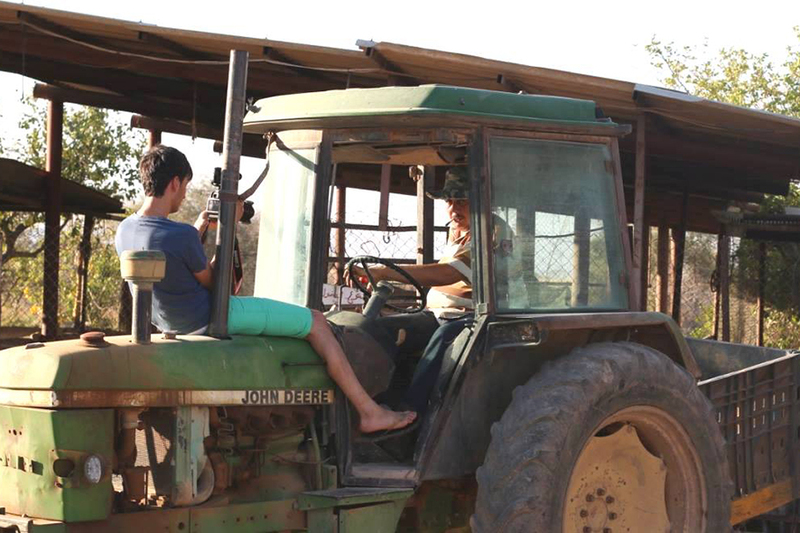 Youth for Change was a project aiming at breaking cultural isolation between Jenin, Palestine, and the rest of the Arab world. It intended to build the capacities of Palestinian youth in circus, drama and street theatre, and to create and present high quality artistic works for Palestinian audiences, by strengthening the partnerships within the Palestinian cultural sector and the larger Palestinian community. 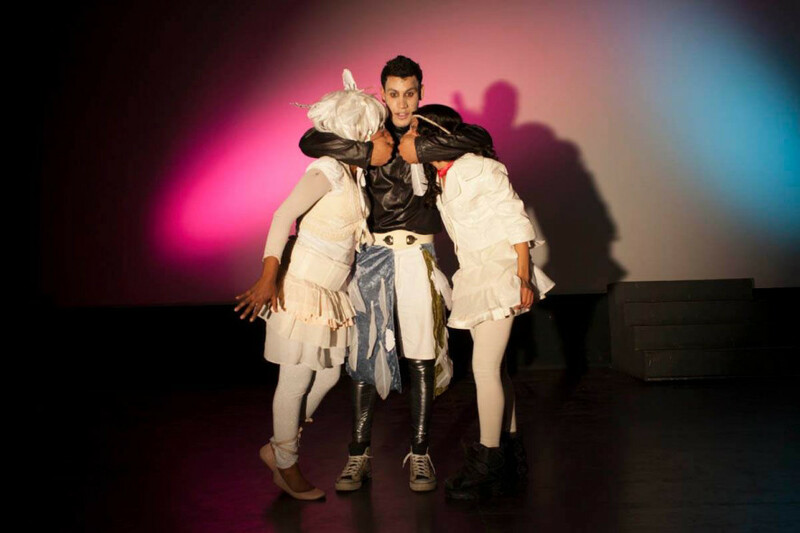 It has been achieved through training youth in combined drama and circus workshops to create a street theatre performance built on their own stories. 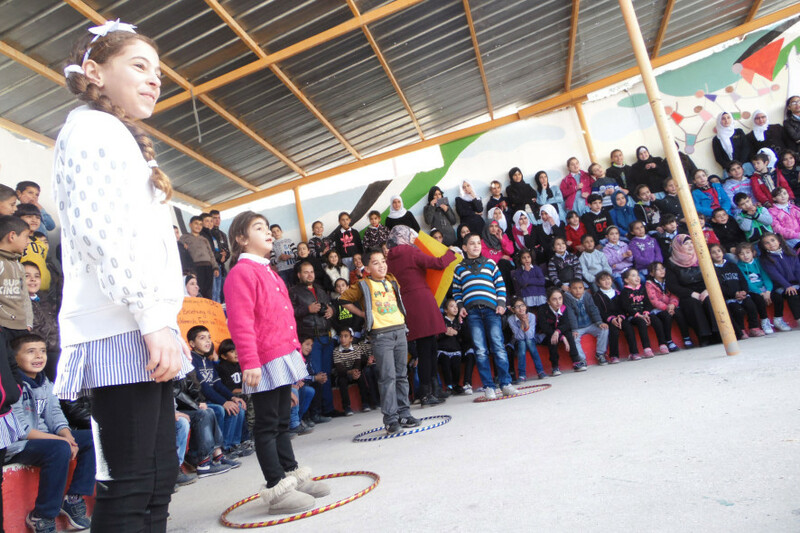 The project has targeted neglected areas in Palestine, and has offered the opportunity for 10 Palestinian participants to travel, perform, and give training in combined circus and drama sessions for women and children in Casablanca, Morocco. The main activities of the project included: training courses and workshops; the creation of street theatre performances; touring in the West Bank; and mobility and exchange of artists between Palestine and Morocco. 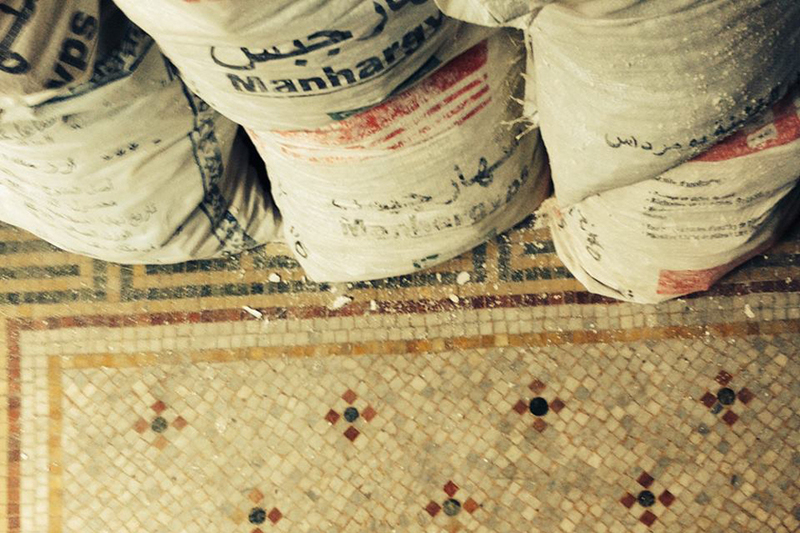 Fragments Theatre is a cultural organisation, founded in Jenin, by a group of actors, filmmakers and technicians. 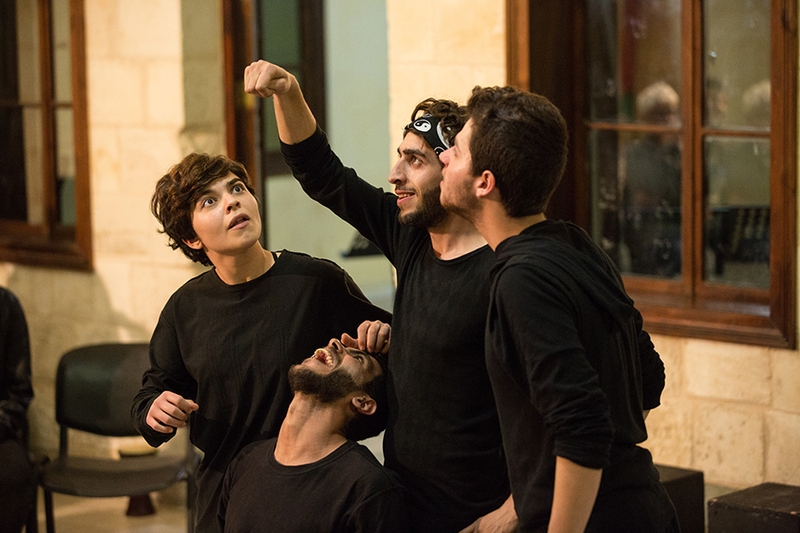 The Fragments Theatre gives young people the opportunity to express themselves using theatre, film, circus and arts in Jenin and the surrounding areas. Over the last few years, several activities with children and youth, have been implemented different theatre plays, short films and puppet workshops. The project has strengthened the dialogue, brought opportunities for exchange, by developing a creative partnership between Fragments Theatre, the Lama Brother’s Theatre in Palestine and Théâtre de l’Opprimé from Casablanca in Morocco, this is theatre company which places art at the core of its activities, representing the social and civic life of Moroccan citizens and trying to preserve the Moroccan identity and its cultural heritage. 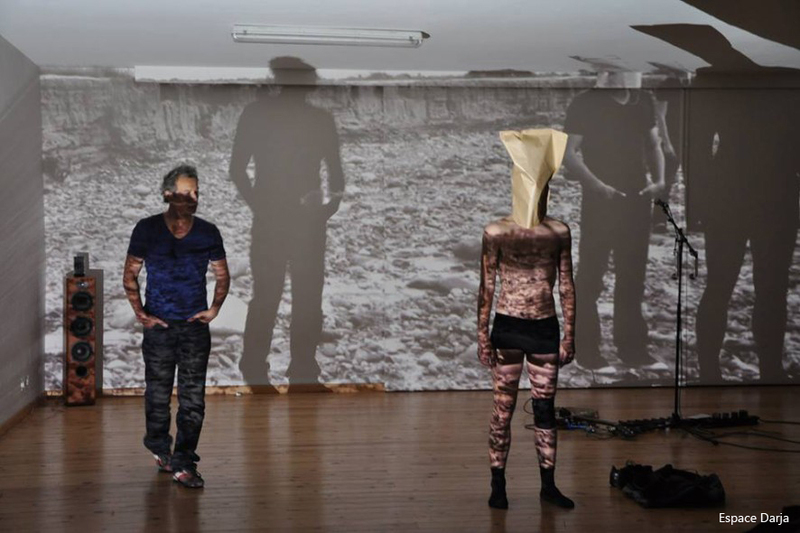 Through a strong network of dance organizations, MEEM aimed to develop and establish a platform for exchange and a solid soil for contemporary dance in the South Mediterranean region. The partnering organizations have worked on building capacities and generating sustainable artistic collaborations based on theoretical and practical activities and practices related to the contexts of their countries and needs. Throughout the full programme of activities, 24 young and emerging artists from 10 different countries have been directly involved. 18 international presenters, in addition to representatives from a number of different cultural organisations have taken part in the activities, and by doing so have become familiar with both the work and the conditions of the artists working in the region. The project is led by Maqamat Dance Theatre, an international dance company founded in 2002 and based in Beirut. In a short period of time, the company has been able to emerge as a central organization in the creation and development of contemporary dance in Lebanon and the Arab region. It is considered today as the founder of a Lebanese Contemporary Dance Scene. This project aims to improve the abilities of young writers and strengthen the role of culture in social cohesion at community level. It will be implemented in Gaza strip, West Bank, and Tunisia. 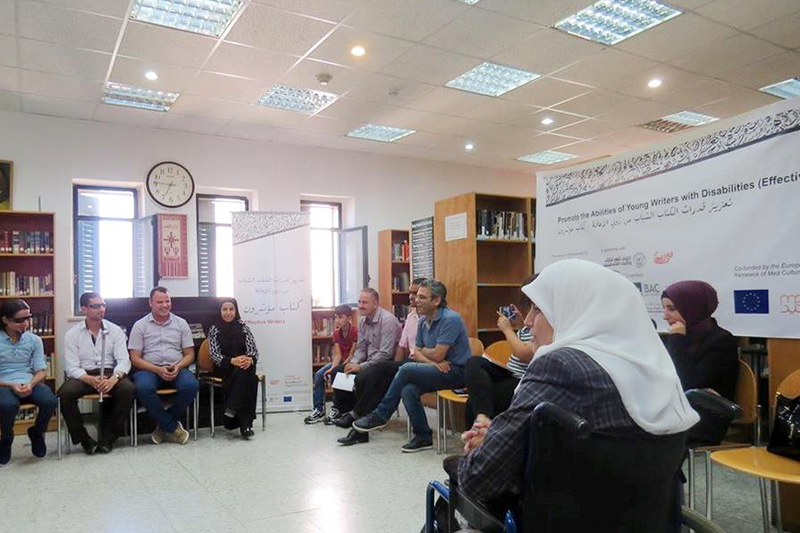 Thirty young writers with disabilities, from Palestine and Tunis, will take part in training program on writing skills, modern publishing techniques but also on the right of expression and the rights of people with disabilities. Project will support launching of electronic forum for young writers with disabilities, the first of its kind in the region. The project is led by the Social Developmental Forum, a Palestinian based CSO, that provides various developmental services for a wide range of social sectors; in partnership with General Union for Palestinian Writers, an institutional union for Palestinian writers; and Fanni Raghman Anni Association, a non-profit association based in Tunisia, working to fight marginalisation and defending freedom of expression and creativity in young people. The aim of the project is to give opportunity to 44 young theatre students in Palestine to work on a professional level, extending professional networks and getting access to new job opportunities. 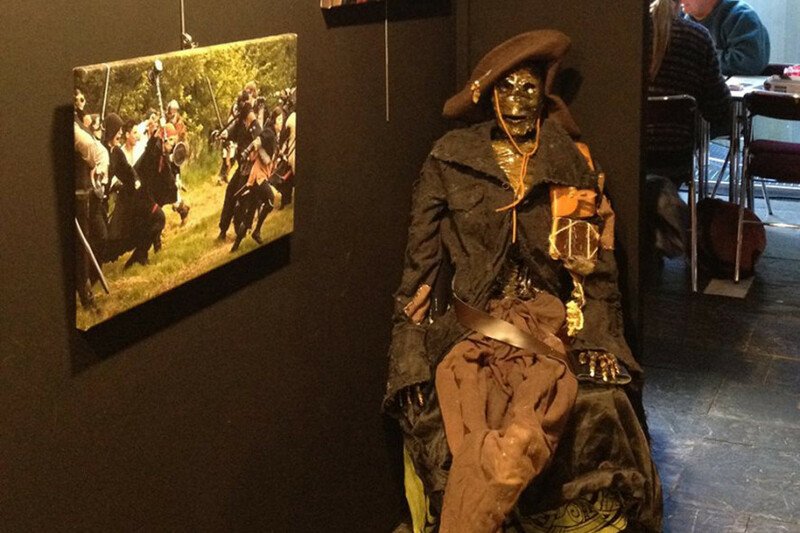 These students will become specialized in the following fields: Light, sound, costume, scenography, stage management & production management for performing arts, assessed by and working with professional actors and directors. As a result a mini festival will be produced, reaching Ministry of Culture, local organisations, partners and communities. The project is led by Al-Harah Theater, a Palestinian based theatre house for children, youth and adults addressing social topics; in cooperation with Dar Qandeel for Arts and Culture, a Palestinian based organisation working on culture and heritage, human rights awareness, democracy, and freedom of expression. In partnership with Al-Balad Theater, a Jordan based theatre and dance house dedicated to produce and promote independent artistic and cultural productions in the region; and Ashtar Theater, based in Palestine, with an aim to promote creativity and commitment for change through a novel combination of specific training and acting programs and services and professional theatre performances. This project will actively involve Palestinian women, elderly citizens and local grass-root organisations in the preservation of intangible cultural heritage that is in danger of extinction. Traditional songs are no longer in use and are remembered only by old people. Women from Women House Development Center will visit villages and refugee camps in the area of Tulkaram; to make sound and written recordings, assemble lyrics in a booklet and record songs on a CD. The project hopes to be only a starting initiative that will raise awareness of this issue and involve important stakeholders that will assure continuation of this practice. 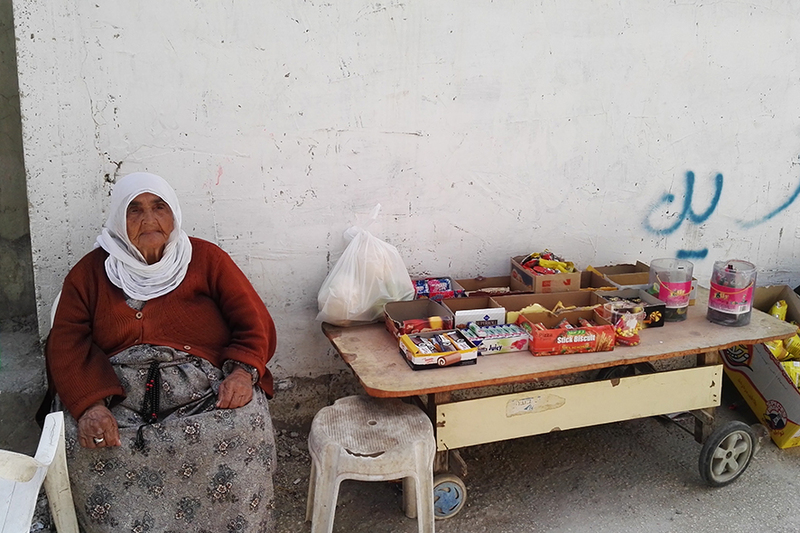 The project is led by Women House Development Center, a place of gathering, creation and learning for local woman; in partnership with Al-Awda Center for Childhood and the Young Welfare, providing social and educational assistance to children and families in need. Both are non-profit associations based in Palestine. 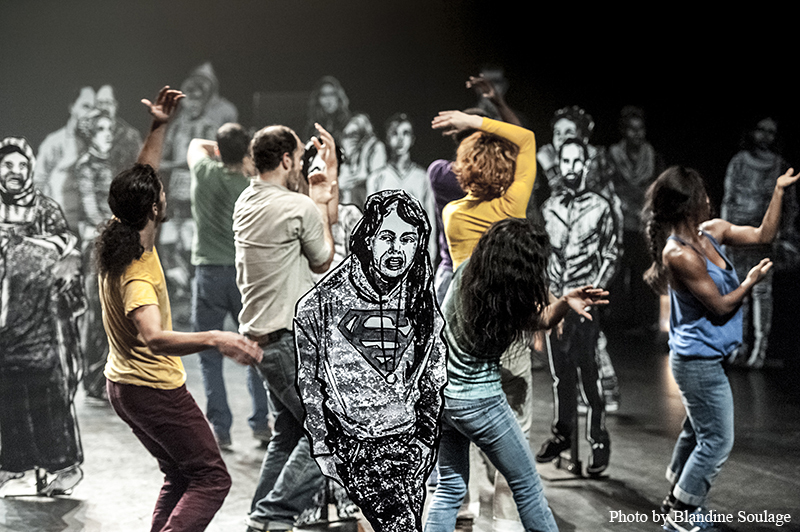 Moultaqa Leymoun is a platform for emerging and established Arab dance artists. Its main purpose is to create a pan-Arab Contemporary Dance collaborative network to enable local and international cooperation and dissemination. The platform will include full-length performances by established Arab artists and a series of studio presentations introducing young emerging talents, their work and future projects. This project will be implemented in Beirut and the Chouf Mountains by presenting 20 choreographers from Lebanon, Tunisia, Morocco, Jordan, Palestine and Iran. The project lead by the Beirut based Association Maqamat Beit El Raqs, a laboratory and a dance space aiming to create the conditions for a continuous development and progress of contemporary dance in the region; in partnership with Saryyet Ramallah- First Ramallah Group, one of the first dance school in Palestine that seeks to disseminate the culture of dance in the region. Twelve young filmmakers from the Palestinian West Bank will meet, to receive intensive training in documentary filmmaking. These films will focus on environmental issues: lack of recycling awareness, pollution of groundwater, the need for rehabilitation of the sewage system, water resources for farmers, and other problems. The results will be six short documentaries that will be screened on different locations. The screening will be followed by an open debate involving as Palestine citizens in further discussion on environmental issues. The goal is enhancing the role of cinema education in the cultural and social development and highlighting the environmental issues in Palestine. This project is led by Young Palestinian Filmmakers, a nongovernmental organization based in Ramallah, dedicated to strengthen young cinema in Palestine; in partnership with Khalil Sakakini Cultural Centre, from Ramallah, which uses cultural practice as a tool for artistic growth in the community; and the Cinema Jenin dedicated to activating the cultural life in Palestine through the screenings of daily films and hosting artistic performances in the fields of theatre, music and dance. Photo by Young Palestinian filmmakers society. This project uses community theatre as a tool for social mobilisation and empowerment. 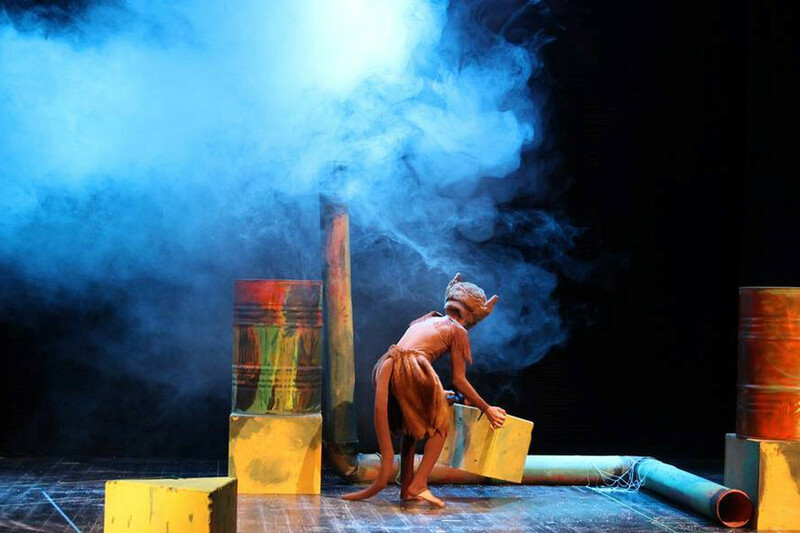 Through capacity building, the project aims to enable its participants to apply interactive theatre techniques to induce social change. Community theatre methods will bring fragmented populations together in a process of reflection, dialogue and mutual sharing of stories that illuminate narratives of trauma, creativity and resilience, building long-lasting partnerships. It will include refugees, Bedouins, students, community leaders, activists and social workers, in the Palestinian West Bank, and Palestinian refugee camps in Jordan. The Freedom Theatre, based in the refugee camp of Jenin, and working on artistic and educational activities for children, youth and women, leads the project in cooperation with Ashtar Theatre, a theatre house based in Ramallah, spreading the culture of theatre in Palestine through training programmes and theatre performances. This project promotes the child rights through art. The right to education will be addressed through four artistic initiatives: theatre performance, music production, art exhibition and dance performance. Each initiative will focus one issue that schoolchildren are facing such as school violence, the inclusion of student with disabilities and the accessibility of schools. The target groups are Palestinian boys and girls between the age of 14 and 16, their families and the community. The project is led by the Defence for Children International – Palestine Section, the only Palestinian child rights organisation solely dedicated to protecting the rights of children in Palestine; Yafa Cultural Center, an NGO dedicated to improving cultural and intellectual life of local people; and Al Harah Theater, theatre house dedicated to create socially engaged theatre plays.